With the September 30 deadline behind us, Congress has allowed the 2014 Farm Bill to expire without extending the 2014 law or passing a new farm bill. The immediate impact is minimal, with funding for federal nutrition programs and many agricultural programs continuing through the end of the calendar year. With prospects for a short-term extension of the 2014 Farm Bill gone and Congress unlikely to return to Washington, D.C. before the November elections, our focus now shifts to trying to help pass a good, bipartisan 2018 Farm Bill later this year. Congress is expected to try again to pass a new bill after the midterm elections in a “Lame Duck” legislative session in November-December. We are continuing to engage our members of Congress to advocate for a strong Farm Bill modeled after the bipartisan version passed by the Senate over the summer. Learn more about the Farm Bill and SNAP, the nation’s greatest defense against hunger, here http://www.frac.org/action/snap-farm-bill. One of the greatest pleasures and opportunities for learning in my job comes when I visit our partners. While I see a lot of food pantries, I was missing the experience of getting to know the food pantry volunteers and clients. So, I decided to start volunteering once a month in my hometown’s food pantry. I live in Kennebunk and while most people think of my town as the summer home of the wealthy, like many communities in coastal Maine, nestled among the million-dollar summer homes are regular Mainers who are working hard to just get by. People are surprised to learn that Kennebunk’s free and reduced lunch rate is 19%. Fortunately, we have Community Outreach Services – a program organized and supported by the area churches to initially provide hunger relief but has been expanded to include fuel assistance and other special needs support such as eye exams, utility bills, and even summer camp scholarships. The hunger relief programs include providing 3 – 4 days of non-perishable food to families that have been referred by the area towns’ General Assistance offices, a weekly fresh food distribution, a Back Pack program, and serving as a summer meals site for the Summer Food Service Program. I’ve been volunteering in the weekly fresh food distribution that includes food from the local Hannaford store as well as items from the community garden, when in season. 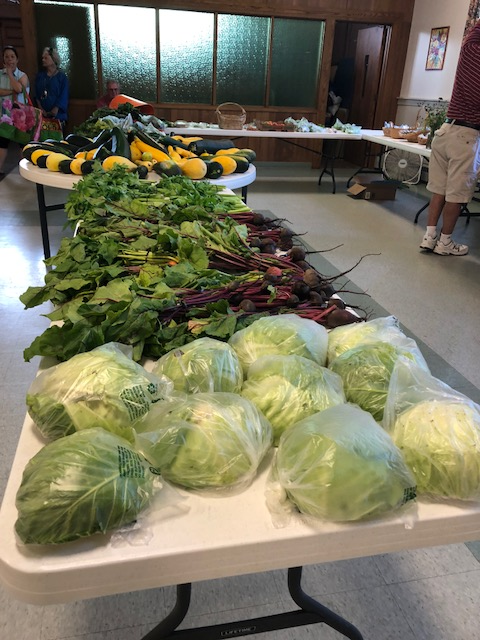 This summer has seen a bounty of beautiful vegetables all grown, harvested, and packed for the food pantry by community volunteers using the community garden space in town. COS benefits from many volunteers who from day one were very friendly and eager to have me lend a hand. Mark Jago, the Executive Director, greets everyone with a smile, pulls us together before every distribution for a quick huddle to communicate schedule changes or the like and always includes a thank you and a reminder of why we are all here. What impressed me from the first day was how well the volunteers knew the clients. I overheard many conversations asking about grandchildren, recent doctor’s visits, latest knitting projects, etc. Seeing many smiles, much laughter, and the number of seniors coming through the door every week, I imagined the friendships among clients and volunteers are as sustaining as the food. I am grateful to be a small part of this community program who, like the hundreds of others across Maine, is helping to make a neighbor’s day a little easier. We continue to collect partner agency equipment and other needs in a central location to help us better understand and seek resources to address the needs of our partners (for more details: Capacity Building) We are using this list to issue grants to agencies, as funding becomes available, on a quarterly basis. Please continue to inform us of your needs! The smell of fresh picked apples in the fall is as nostalgic as the scent of pine in the winter. Apples are a great fall fruit that can not only be eaten as is, but can be transformed into delicious fall eats. There is just something comforting about the smell of cinnamon and apples in the house. Try these apple recipes year round with the supply of apples through Good Shepherd Food Bank’s Mainers Feeding Mainers program. What is the Good Shepherd Network Advisory Council? Chances are you have met a member. You have maybe even asked them to log your praise or complaint and get their message delivered to caring ears. So, I wanted to take a minute and tell you a little bit about what we do and who we are. First, the Council is comprised of members who represent food closets, food kitchens and other services from all over the state of Maine and some Good Shepherd staff. We are often visited by various Good Shepherd staff members who would like our input on special projects. Good Shepherd formed the Network Advisory Council for getting local representational feedback and to have the opportunity to learn more about each area in our big state. Everyone on the council does care about the issues each and every charity faces on a day to day basis. However, instead of reporting an incident we heard or experienced, we concentrate our time on how all our issues can be resolved together and how all our dreams to end hunger in our area can come true. It takes the gathering of a ton of data to come up with the big picture and to find a way to resolve the services issues we all face. This data is what is used to develop new programs and services offered by Good Shepherd such as their cooking classes and food safety training. What amazes me is the amount of work that goes on behind the scenes for Good Shepherd to be as efficient as they are! When our council hears of a new project, it is because they are taking the time to hear all the ideas and questions to be answered before presenting them to the rest of their partners. In the long run, this gets goals met faster and creates a better product. The other advantage to the Network Advisory Council is as a conduit. We are a small representation of the many of our area but still come to the table with local knowledge. We can hear what is needed from our area to fill in the gaps in localized data. We can share our experiences with others from across the state. And that is the greatest reward, all the sharing of ideas and resources! We find we all have a lot in common and working together sharing our gained knowledge improves all our services. We are able to bring back all this information to our area meetings about what is happening state wide and report on issues that are being addressed. I hope you continue to read our articles and see what we do when we meet. Have you heard about Good Shepherd Food Bank’s newest program? The Community Health and Hunger Program is bringing together the worlds of healthcare and hunger relief to address growing concerns around the impact of food insecurity and poor nutrition on health. The connection between food insecurity and poor health is clear. Over the past few years, researchers across the United States have found that poor nutrition associated with lack of access to healthy meals increases an individual’s risk of developing chronic illnesses such as type II diabetes, hypertension, cardiovascular disease, osteoporosis, and can negatively affect mental health. 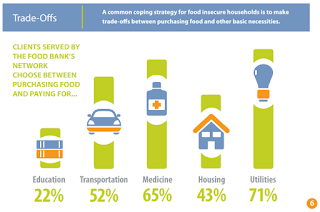 Food insecure households are forced to adopt coping mechanisms that not only increase their chances of developing a chronic condition but also impact disease management. In our 2014 Hunger in Maine Report, we found 67% of households living with food insecurity reported purchasing more affordable but less nutritious meals just to have enough, and 65% of households served by our network are making tough decisions between food and medicine. The impact that food insecurity has on poor health is a growing concern among patients, healthcare providers, and the public health community. With the highest rate of food insecurity and chronic illness (type II diabetes, hypertension, and obesity) in New England, it’s clear that we need to explore new ways to connect community members with our ending hunger network in Maine. The Community Health and Hunger Program is partnering with healthcare providers across Maine so together we can better identify and remove barriers for Mainers who lack access to nutritious food. We are working with over 35 healthcare providers to help connect patients to ending hunger resources and provide emergency take-home meals at the healthcare site. An essential element to the program is the successful connection to local ending hunger resources. We have found that many patients are unfamiliar with the local food pantry or community meal site or may not know all the great things that our food pantries have to offer. In a survey of patients that participated in the program last year, over 50% reported an increased knowledge of the local emergency food programs after visiting their doctor's office and nearly 60% reported visiting a local pantry as a result of the program. In partnership with our food pantry network, our healthcare partners have connected over 1,400 patients to the nutritious meals they need to live healthy lives. In addition to connecting patients to the local food pantries, we have found that connecting our healthcare partners to our agencies is a great way to support established ending hunger work and connect food pantry clients to health services. Our healthcare partners can often offer medical screening services for pantry clients that may not have access to traditional healthcare services, volunteer support for food pantries or meal sites, and support as advocates for the food pantries and ending hunger programs in their communities. This year we are focused on growing the program even further to include more healthcare sites and food pantry partners to connect more patients to our ending hunger community. If you are interested in learning more about the program or would like to learn more about how you can support the referral process, please contact Laura Vinal, Program Manager, lvinal@gsfb.org. Hunger in America 2014: Report for Good Shepherd Food Bank, Feeding America, August 2014. http://www.gsfb.org/wpcontent/uploads/2014/10/FB259_report.pdf. "Maine County Health Rankings". 2017. County Health Ranking and Roadmaps. http://www.countyhealthrankings.org/app/maine/2017/overview. Annual Partnership Renewal: How has a year already gone by? This December we will be sending out our annual Renewal form. We are working on streamlining this process, so please expect more communications on this subject as we got closer to December!